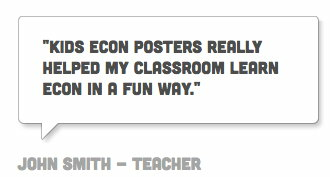 The Half-Pint Economics Curriculum is designed for lower elementary grades, and was written by KidsEcon Posters authors Heyse and Harlan Day. It contains 20 lessons that covers 11 of the KidsEcon Posters concepts, as well as an additional seven concepts that will help kids manage money. Table of Contents. Each lesson contains four parts: a title page with an explanation of the concept, an activities page with questions to ask students, and two worksheets. Also included with the book are an Econ Book Report, Journal Writing ideas and Other Activities, Half-Pint Vocabulary, and a Half-Pint Glossary. Sample Lesson. Half-Pint Economics is the perfect companion to KidsEcon Posters. 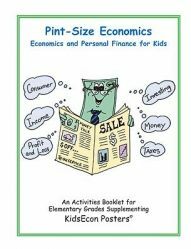 The Pint-Size Economics curriculum is designed to teach elementary students about basic economics, saving and investing, and being a wise consumer. It features 24 lessons, with each focusing on a specific concept. Table of Contents. Each lesson contains four parts: a title page with an explanation of the concept, an activities page with questions to ask students, and two worksheets. Also included with the book are an Econ Book Report, Journal Writing ideas, Enrichment ideas, Pint-Size Vocabulary, and a Pint-Size Glossary. Sample Lesson. Pint-Size Economics is designed not only to teach basic economics and personal finance, but to also implement language arts and math. The Teachers Guide contains Teaching Ideas that you can use very effectively with the KidsEcon Posters©. The activities are fairly simple to do and don’t take up too much (scarce!) class time. Don’t forget to review the explanation of the economic concept(s) given at the beginning of each lesson. Finally, each lesson lists books that you can use to teach or reinforce the concepts. When you go to the Literature Connection, you will find short lessons on each book. The lessons consist of questions – focusing on the economic concepts – that you can ask your students as you read.